The hardest part of adding pregnancy so far is spelling it right every time. Anyways building a pregnancy system that basically adds like the sick system. 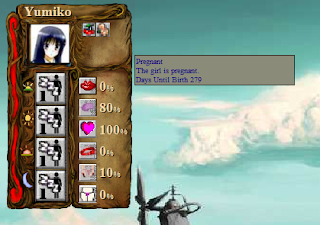 All event system based except that there is a variable in the girl to count days pregnant as it would have been a pain to do it using on the fly variables. Event for pregnancy pops fine, days down pops fine. Still working on popping pop day.